I am faced with a choice between preaching the seemingly unrealistic, “Don’t worry” or preaching the perennially unpopular, “If you let money rule you, better worry.” I believe you would agree, it is not much of a choice. So, I’m going with the second; better to be unpopular than sound unrealistic. Our gospel passage starts off with this little saying from the Lord, “No one can be the slave of two masters: he will either hate the first and love the second, or treat the first with respect and the second with scorn.” And just in case some may speculate as to what He is referring to, the Lord nails it by adding, “You cannot be the slave both of God and of money.” No room for ambiguity or speculation here! The original “mammon,” a Semitic loan-word, is often left untranslated. But our text translates “mammon” as simply money. To be fair, the original word does not have a negative connotation. Yes, it could refer to material possessions or to money. There is nothing really bad about that. The word itself, however, has a more revealing history. Originally, it came from another root word which means “to entrust,” therefore, “mammon” was something entrusted to a bank, for example, or to a safe deposit box for sake-keeping. Eventually though, this meaning got twisted in a way to mean the reverse. 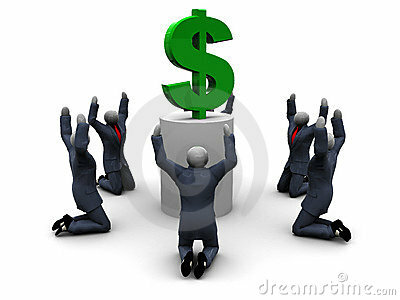 “Mammon” came to mean, not that which is entrusted, but that in which a man puts his trust. The end of the process was that “mammon” came be to regarded as nothing less than God. What this passage is definitely not saying is that material goods or money are bad things. On the contrary, money and security can be good. Most of us would like more of each –just in case. But, at the same time, most of us realise the limits of money and security. Money cannot secure you against death and by no means does it automatically bring happiness. Money is supposed to be our servant, not our master. We should use money instead of letting it use us. So “mammon” in itself, is not the enemy. If money is not the issue, then what is? This text is really reminding us of a choice we must all make and that simple choice is either to be a slave of God or to be a slave of mammon. Therefore, the danger to our hearts and to eternal life with God lies not in the values of this world, power, wealth, fame or pleasures, but in their potential risk for ensnarement. By setting our hearts on them, would mean that we are not setting our hearts on what is truly lasting and of great value. The choice between Mammon and God, though always difficult, seems easy to comprehend. What seems less comprehensible is that we are asked to be “slaves” of God. There are several Greek words for “servant” but St Matthew deliberately chose the Greek word for “slave” – “doulos.” When we say “slave”, we have a rather distant historical revulsion to the word. That is because “slave” has become a dirty, evil word in our day. “Indentured worker” would have been a nicer word. If you think that’s a hard word for us to swallow, imagine how hard it was for those living in the midst of slavery to swallow that idea. Slavery reduced human beings to the state of animals and chattel, something and not someone to be owned by another, whose life and survival depended on the good will of the Master. Every rational person would logically and vehemently reject the idea of becoming someone’s slave. So, how could becoming a slave to even a most benevolent Master, God in this case, ever be a good thing? Just like our times, the Greeks who lived during the time of the New Testament, saw citizenry and freedom as the pinnacles of life. Personal dignity was attached to freedom, being a doulos was the worst, it was the ultimate opposite. Slaves had no freedom. They had no rights. They had no legal recourse in the courts. They had no citizenship. They had no possibility of doing what they wanted to do. They weren’t asked their opinions. They had no choice about anything, not even personal issues like getting married or having children. They owned nothing, not even the children they bore. They were totally dependent on whoever owned them. It is no wonder that free men had only scorn for slaves and slaves longed to be free. So the idea of Jesus coming along in that world and announcing to people that they must become a slave of God, would have sounded incredulous and scandalous then, as it would now. Nobody is going to line up to become anybody’s slave. Slaves already had enough of slavery. Free men had nothing but disdain for slavery. And yet the New Testament holds back absolutely nothing. We’re called to be slaves. It is the ramifications of this status of being slaves which clarify our relationship with God. God possesses exclusive mastery over us. We are not in possession of anything which does not belong to God, not even our own lives. We have been redeemed by His Son, we have been bought with a price. We possess no status or identity apart from what is accorded to us by Him. And, that’s not really a bad thing. If being a mere slave in the household of Caesar carried great weight and prestige in ancient times, just imagine being part of the household of God – we are a royal priesthood, a holy a nation, we are God’s children. More importantly, the slave had complete dependence on his master for everything, absolutely everything. It is here that we come to understand the rest of the passage. Jesus presents the case for slavery to God. God will provide, so we will not need to worry about anything. Look at the beauty of nature. The birds do not sow or reap. The flowers do not work or spin cloth. Yet they are provided for by God. Human beings are worth much more than these. How could God not provide for us as well? All our needs are provided by God. This is the basis of Jesus telling us not to be anxious. But being a slave to mammon, we will have to labour and toil under the harsh whip of a taskmaster who would be constantly pulling our strings. That’s the real irony that besets modern man. The more he seeks to be free and autonomous, the more he becomes enslaved to his own temporal desires and impulses. Let’s be honest, as much as many of us may claim that we are slaves to no one, there is a whole array of forces, both internally and externally, that shapes our decisions and our behaviour. There is always someone or something pulling our strings. Many in our time reject all authority, seeing it as an imposition on their freedom. They regard religion and God as obstacles and even enemies to their personal freedom. They plough ahead, enslaved by a flawed and unattainable notion of individual autonomy. But when we freely choose to submit ourselves to the sovereignty and authority of God, we become truly free. Only God, as a master, who respects our free will, accords us the dignity and the freedom to love Him without coercion or pressure. There are so many whips working on us in our modern world, lashing tirelessly, desperate to prevent us from looking beyond creation to the Creator. So many people think of a relationship with God as a burden, a harsh and rigid enslavement. In order, to expose the fallacy of our thinking, it was not enough for us to be told. The Lord had to show it. He put off the regal air of His divinity and assumed the lowly and humiliating position of a slave in order to show us the liberating path of a true slave of God. This is also our journey today. It is a journey which takes us by way of the cross of Calvary, from death to life. So let us renounce our allegiance to “mammon.” Let us pledge ourselves to Christ. Let us cast off the yoke of our oppressors, whoever or whatever they are in our lives, and shoulder the load of Him whose ‘yoke is easy and whose burden is light’ (Matthew 11:30). It is only in this gentle mastery of Christ, that we find true rest for our souls.